Damsons are considered by many gardeners to be the finest example of plums. Langley Bullace damson plums are one of the better fruits for canning and cooking. The name seems to point to large fruit, but actually Langley Bullace trees produce fairly small plums. Nonetheless, the tree is worth growing for its interesting form and the tart, firm fruits that make excellent preserves. In the U.K., growing Langley Bullace damson plants or any of the other damsons is quite common. These varieties of plum prefer temperate weather and have very hardy natures. They are also noted for their sharp flavor, and many damsons are too tart to eat out of hand, as is the case with Langley Bullace. Langley Bullace damson care is minimal once you start your tree off right. With good training, it will produce a bumper crop of culinary fruit. Langley Bullace is a self-fruitful tree that produces round to oblong, clingstone fruit. It was first raised in Langley, U.K and introduced in 1902. The tree develops long, downward growing branches when young which twist upward as they mature. Trees are self-fertile but a pollination partner can help increase yields. White flowers cover the plant in early spring. Langley Bullace damson plums are bluish-black under a powdery coat, with firm green flesh. Expect crops in autumn, usually late September to early October. Damsons can grow in United States Department of Agriculture zones 5 to 8. They prefer full sun locations with fertile soil and a pH of at least 6.0. Work compost or well-rotted manure into the planting hole prior to installing new trees. This will also help enhance drainage, another important component to growing damsons. Plant in the dormant season and water the tree in well. Langley Bullace can be espaliered or trained to trellis or wire. Set a stake in with young plants at installation to keep the central leader supported and straight. Keep the soil evenly moist but not boggy as the tree establishes. Pruning and training young trees is the most important part of Langley Bullace damson care. 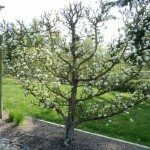 Pruning the plum tree will help shape the side branches and create a pyramid shape that helps support heavy crops. Heading back branches that haven’t forked can encourage new growth. Pruning should be done during the dormant season. Use organic mulch around the root zone of the plant to conserve moisture, gradually add nutrients and prevent weeds. Fertilize damson trees in early spring with a balanced food. Watch for aphids, caterpillars and mites. The most common diseases are fungal and may be combated by using a copper fungicide in early spring before bud break.